Gorgeous competition ice skating dress has a 'ribbon' wrapping around and down your arm! Elegant girls competition ice skating dress with sweetheart bodice and deep back! Classic styling with elegant details!This beautiful ice skating dress has a 'v' shaped notch in the neckline. Lovely ice skating dress has detailed 'cut-out' shoulder strap, and dramatic back. Lovely long sleeved competition ice skating dress with classic style. Beautiful girl's competiton ice skating dress features asymmetrical, sweetheart bodice and one sleeve. Fantastic Arabian-style competition ice skating dress for your Arabian or Egyptian music! Be the belle of the ball in this enchanting girl's competition ice skating dress. Adorable girl's competition ice skating dress is perfect for pirate music, peasant music, or gypsy music! Beautiful halter-style competition ice skating dress looks amazing with your music! Ole'! Fabulous Spanish style competition ice skating dress gives your Spanish performance flare! Beautiful competition ice skating dress will take their breathe away. You will look elegant in this halter-look spandex skater dress. Elegant and edgy! This competition ice skating dress features an incredible sweeping back design. This ice skating dress is truly lovely! Spandex dress has wonderfully subtle color mixing. This skate dress has a beautiful 'X' design in back with deep keyhole look. Simply elegant! Ice skating dress with one-shoulder-strap look has a beautiful, crystal broach pulling in the gathers of the strap. Gorgeous and flowy – this ice skating dress will make you feel like a princess. Elegant and classical – this ice skating dress has romance and grace! Exciting jazz style ice skating dress has impact and energy! Simply fabulous! Ice skating dress with winning style. Intricate "x" strap details on the bodice are set off by plunging back and sweetheart neckline. Spanish style competition ice skating dress with beautiful details! Jazz figure skating dress with pizzazz! Black velvet dress has contrasting color accents and skirt flounce. Black mesh long sleeves have fingerpoints. Looking for unusual? This is the ice skating dress for you! Mesh over-lay bodice is accompanied by a multi-layered mesh skirt and gently flared long sleeves. Elegance in motion. Skating dress has gathered bust, long mesh sleeves, and flowing 2-layer mesh skirt. 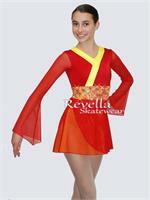 Fantastic Asian style ice skating dress has long flared mesh sleeves and accent color neckline detail on spandex bodice. Jazz ice skating dress with show-stopping style! Diagonal bodice accent flows straight into the skirt. Long gloves with accent cuffs are attached to the bodice with suntan mesh.